With an increased focus on HR analytics and data development, specialist HR positions in MNCs and large local firms are expected to be in demand in Singapore this year. Additionally, C&B managers, HR business partners, in-house trainers, and talent management professionals will be highly valued, especially those with Asia Pacific or Southeast Asia experience. These insights, featured in Links International’s 2017 Asia salary snapshot, also cited an eminent increase in role doubling, as this is a cost-effective solution that companies undergoing restructuring and expansion are taking on. In line with such trends, HR directors (including those in regional roles) with 10 to 15 years of experience can earn upwards of S$15,000 in 2017, per the report’s salary index – in Hong Kong, that adds up to HK$100,000 and upwards, while in China, the range is RMB 60,000 to 120,000. HR managers (including those with regional roles) with 6-10 years of experience can expect to take home between S$6000-14,000 (HK$40,000-85,000), while HR executives with 3-5 years of experience may earn in the range of S$3,000-4,000 (HK$20,000-32,000). Regional functional roles are expected to grab a large slice of the salary pie, with training directors expected to earn S$10k-18k (HK$70k-100k), while C&B directors/managers with 10+ years of experience can enjoy anything upwards of S$15,000, similar to HR directors. 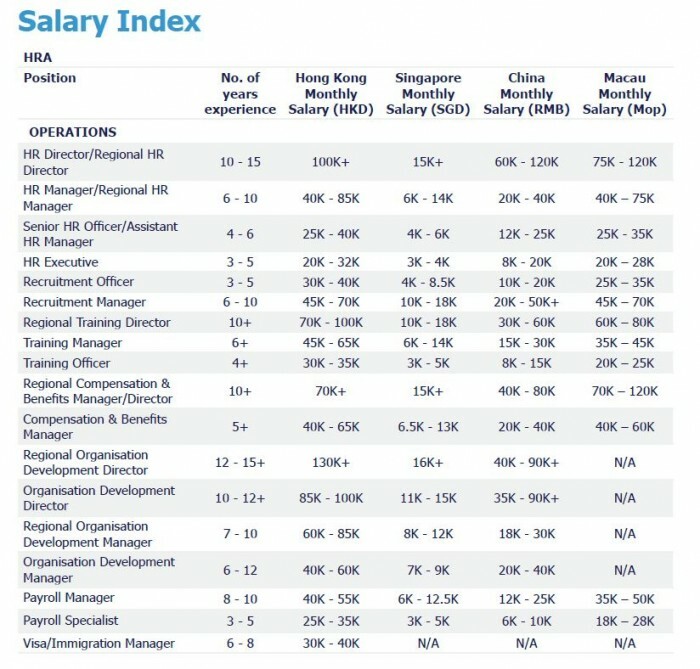 Additionally, regional directors in organisational development (OD) are expected to earn upwards of S$16,000 (HK$130k+), while recruitment managers with 6-10 years of experience are targeted to earn S$10k-18k in Singapore, and HK$45k-70k in Hong Kong. In 2016, global economic and political issues continued to affect the employment market. Organisations have continued to be conservative with recruitment spend, and cost saving has been at the forefront of the hiring process. To achieve this, many organisations continue to build their talent acquisition and campus teams, resulting in a high demand for HR managers, recruitment managers, and HRBPs. Employee turnover remains one of the most challenging topics for HR professionals, thus experienced HR professionals continue to be in high demand. The number of passive candidates saw a slight decrease in H2 2016, while the number of employers looking for immediately available candidates has increased. HR professionals specialising in C&B, payroll, L&D, and mobility are still in demand across all corporations. Candidates with regional or China exposure possessing English and Chinese (Mandarin) language skills are particularly valued, as companies continue to expand into and relocate key roles to PRC. However, interview processes are generally taking longer for MNCs, as employers are not only seeking talent with the right experience and skills, but also a cultural and motivational fit. On the contrary, SMEs recognise the talent competition and are able to make offers in a timely fashion (within a week in some cases). 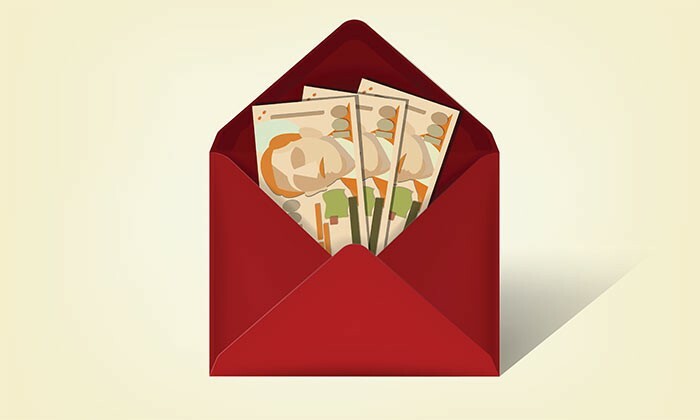 Overall, salaries in Hong Kong this year are expected to increase slightly between 3-6%, keeping at the salary inflation benchmark at 4%, where candidates from the banking and financial services sectors are still seeing the highest increases when moving to a new role of 15-20%. The range for year-end bonus is 1.5-2.5 months of base pay, depending on experience level, individual and company performance. Human Resources gave voice to Links International MD, Nick Lambe for a breakdown of the trends. HR as well as OD directors in Singapore are taking home approximately the same range of pay each month. What does this imply? This would imply that the emphasis on organisational development is becoming more and more important in these changing economic times. Being disruptive in the market place relies on organisational efficiencies and thus an efficient workforce can respond to the client’s needs, demands and market challenges more effectively. What’s making C&B roles more valuable? Whilst remuneration and compensation aren’t the only factors in staff attraction and retention, more and more organisations are looking to provide more comprehensive compensation and benefits plans, including long-term incentives and options for top employees to act as a retention tool. This is developing the role, and therefore the compensation, of C&B professionals as well. With the increase anticipated in role doubling as a cost-effective solution, how will this impact HR specialists versus generalists? Generalists will purely notice that their workload across all areas will increase and they may find that they are spending more time on process-orientated tasks and less time on tasks with strategic value. For specialists, we would expect that people would end up with duel responsibilities, such as recruitment and learning & development, rather than just L&D. Try asking high-potential candidates these questions to find out what they really think. ..